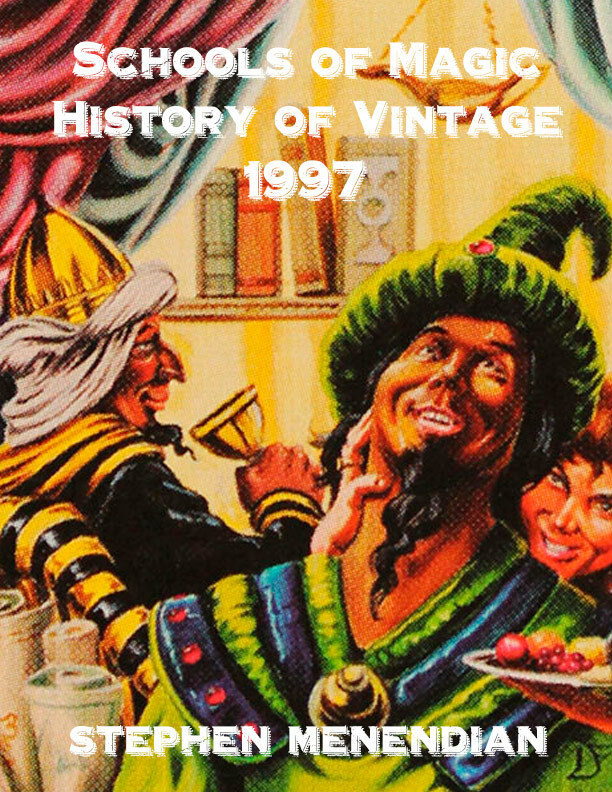 Building on the previous chapters of the Schools of Magic: History of Vintage series, author Stephen Menendian has uncovered a treasure trove of lost decklists and forgotten history as he explores the trends, experiences, and metagame of Type I in 1997, the fifth year of Magic. Whether you are a student of the history of the game, a fan of the early years of Magic, or simply curious about the early years of Vintage, this article is not to be missed. With fifteen tournament winning and high-performing decklists and in-depth analysis, this article is perfect for those who want to relive 1997, as the first age of Type I Magic draws to a close. Learn how new printings and design innovations from Visions to Tempest transformed the Type I metagame and affected the Banned & Restricted List. Finally, Stephen magnificently deconstructs the six Schools of Magic that emerged in the year early years of the game, and continue to persist today. Do not miss this 27+ page epic covering a pivotal year in the history of Type I/Vintage. Although most of the big, important ideas of deck design and structural insights about the format had arisen within the bowels of Type I, that was not always true. There was sometimes a cross-fertilization of ideas across formats. Although major decks had emerged in other formats, like Type II, it was rare that they spawned a major Type I archetype. The genius of Alan Comer brought into existence something that would define Type I for the rest of its existence. Alan Comer called into being not simply an innovative and inexpensive deck, but an entirely different approach to deck building, that is, in some ways a strong and important counterpoint to the principles developed by Brian Weissman. Instead of building a deck with a large mana base, Comer built a deck with an intentionally small mana base. Why? If a deck has fewer lands, it can generate virtual card advantage over the course of the game by drawing relevant spells at a greater statistical frequency than the opponent, when the opponent is more likely, on a relative basis, to draw lands and mana sources. This is the opposite of Weissman’s view of a mana base, which emphasized the importance of making land drops in order to avoid discarding countermagic prior to a counter-war. The idea of substituting land for blue cantrips was later refined into a ratio of design, and has become embedded into deck design principles in Vintage and Legacy. Weissman did not have this option available to him, since the first cantrips did not arrive until Ice Age. It would be some time before a deck like this made its way into Type I, but when it did, it would arrive with a vengeance. And it would be Alan Comer who would be responsible, thanks to his creation in the Summer of 1997.